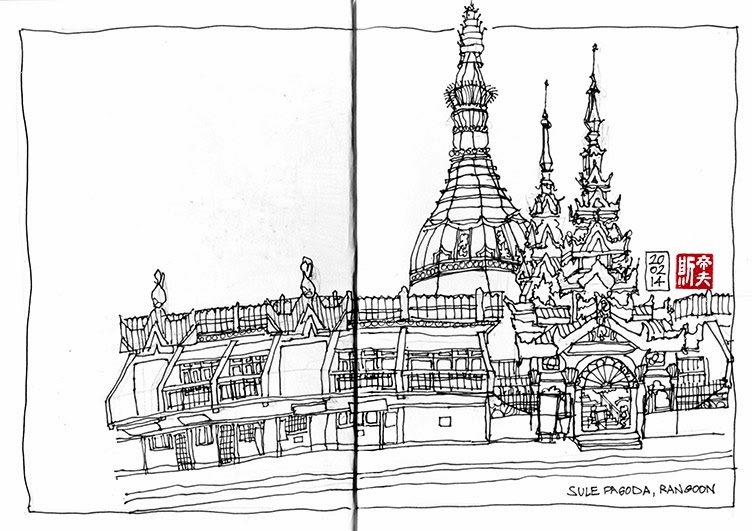 Half an hour before sunset is not an ideal time to start a sketch, but I set up camp on a low wall around a tree on the northern side of the Sule Pagoda roundabout and started to doodle. A few moments later, a chap sat down close to me and stayed for the next hour. I was soon scribbling in almost total darkness which required the sketchbook to be held vertically to catch the headlamp lights coming from the cars on the roundabout. I realised after a while that the gentleman was discreetly shuffling closer and closer until he could contain himself no further. 'You are the BEST artist,' he exclaimed. I do like meeting characters like this; somehow it makes each sketch more memorable. This looks an amazing place you are at. Weather continues wet here in UK. I'm trying to think of some other skill you need to master as you seem to have got the art, language aspects covered. Howabout darts?